5 plugs in one! Power multiple portable devices at the same time with one handy charger. Great for charging at home, in the car or on the Go! 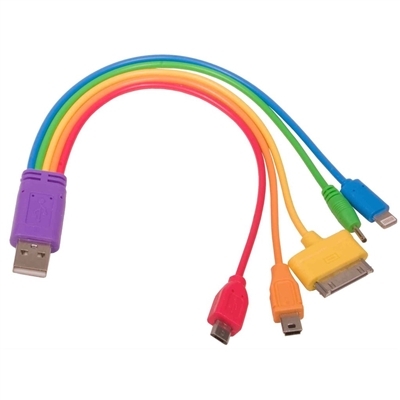 Easy to use, just plug the USB connector into your USB port and plug in one or more mobile devices to one of the 5 matching colored plugs. Adaptor compatible w/: Apple Lightning, USB-C, Apple 30 Pin, Mini-USB, Micro-USB devices.